Make sure your car is as secure as possible. Here are a few things you can do to help keep your car and its contents safe from potential thieves. As reported in The Telegraph, in the last year there were almost 358,000 reported thefts of or from a car according to the Office for National Statistics. This goes to show that cars and their contents are not quite as safe as we all think. We are part of a generation where an alarm and immobiliser are no longer always enough to protect your car from thieves, so it is important to make sure your car is as secure as possible. Here are a few things you can do to help keep your car and its contents safe from potential predators. 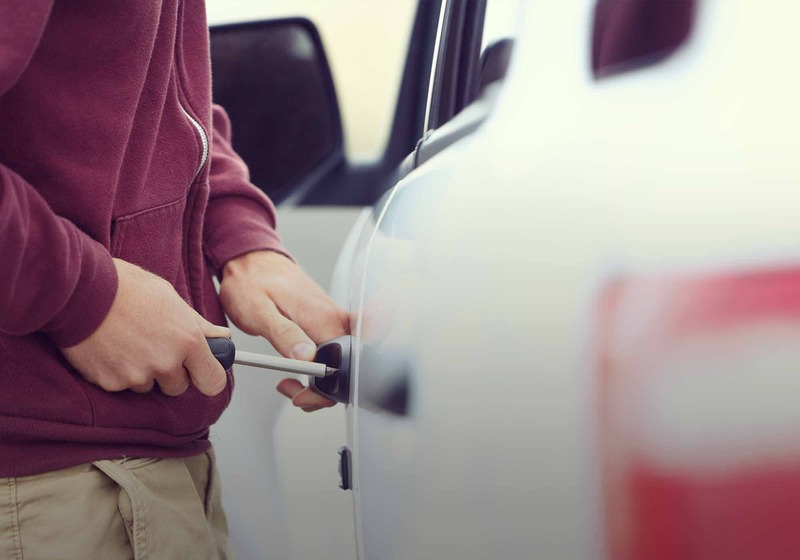 It may sound obvious but checking that your car is actually locked is an important step in protecting it. Try to get into the habit of pulling the door handle before you walk away to make sure that the locks are working. Sometimes with modern cars and electric key fobs faults can happen, meaning that although you press the button the car may still be unlocked. Again, this may sound like an obvious one, but if thieves can’t see any valuables in your car then they might be less likely to want to break in. You may want to put satnavs, wallets, mobile phones and handbags under the seats or in the glove compartment, and try to avoid leaving jumpers or blankets piled on the seats as thieves may be intrigued by what could be lurking underneath them. When you have to park up and leave your car, try to find a spot that is well lit – ideally under a lamppost. Try to park as close as possible to where you will be, like a shopping centre or restaurant, and park close to other cars. Thieves are more likely to target cars that are parked on their own, in areas where it may be darker and harder to see. Even if you’re only popping away from your car for a second, to post a letter or grab your keys, make sure you turn your engine off and take your keys with you. This may feel like its not worth the extra effort, but thieves lurking in the shadows only need a second to jump into your car and disappear. This is also one to remember in the colder months when you’re de-icing your car. Car security has improved so much over the years that sometimes the easiest way for a thief to steal your car is to break into your house and steal your car keys. Police around the country are advising motorists not to leave their car keys near the front door. Instead, they should be kept out of sight in a safe place. The latest Crime in England and Wales publication from the Office of National Statistics states that around 4 in 100 vehicle-owning households were victims of vehicle-related crime in 2013. With this in mind, it’s really important to do everything you can to protect your car – and yourself. Think about where you keep your keys and make sure you’re using all of your cars in-built safety features to your advantage. After all, it’s much better to take a little time to try and prevent something bad happening than having to deal with it after. Don’t forget, if you have car insurance with drive like a girl, the black box works as a tracking device. This means that if the worst should happen and your car is stolen, we can supply GPS information from the box to the police and try to help them track your car down. If you think your car has been stolen, you should contact your local police to get a crime reference number before calling your insurance company. If you’re a drive like a girl customer, contact the claims department on 0330 022 0123. We’ll then be able to start monitoring the location of your car and liaise with the police.